Reboot Illinois | Reboot Illinois aims to encourage citizens to retake ownership of our Illinois government. In his budget speech in February, Gov. Pat Quinn warned, “Our rendezvous with reality has arrived.” But we’re still waiting on the rendezvous with the reality of a public pension system that’s taking money from education and other vital needs. That is expected to arrive in January, probably with the help of nearly three dozen lawmakers who will be leaving office the day after casting their votes. Jesse Jackson Jr. was part of “a whole cadre of politicians who knew Blagojevich was radioactive, but dealt with him anyway,” writes Natasha Korecki. Korecki covered both Blago trials for the Sun-Times and had a ringside seat as prosecutors untangled the web of corruption that defined the Blagojevich administration. Her book, “Only in Chicago: How the Rod Blagojevich Scandal Engulfed Illinois; Embroiled Barack Obama, Rahm Emanuel and Jesse Jackson Jr. and Enthralled the Nation,” details a dark chapter in Illinois’ political history. His name is Squeezy and he has come to take away your education, kids. That’s the message in Gov. 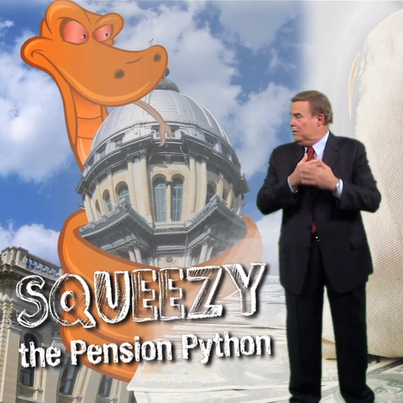 Pat Quinn’s new campaign to educate the public, even children, on the dangers of the current pension system. 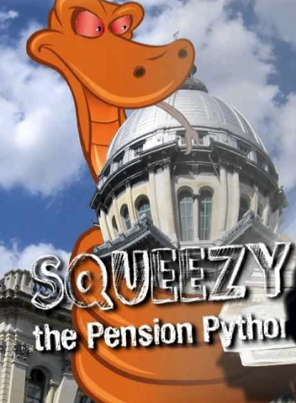 Squeezy the Python is also squeezing money away from road building, public safety and other essential government functions as the state shovels more and more money into its ever-growing pension system.